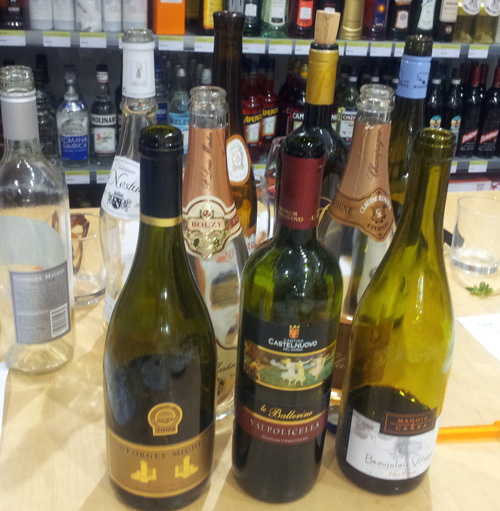 Just in time for a lovely weekend heat wave as July gets under way, we had our Summer Wines blind tasting event at Amathus Soho! With a trio of whites, two pairs of rosé (one with bubbles!) and a trio of reds to tickle our taste buds – we were eager to get started and get tasting! 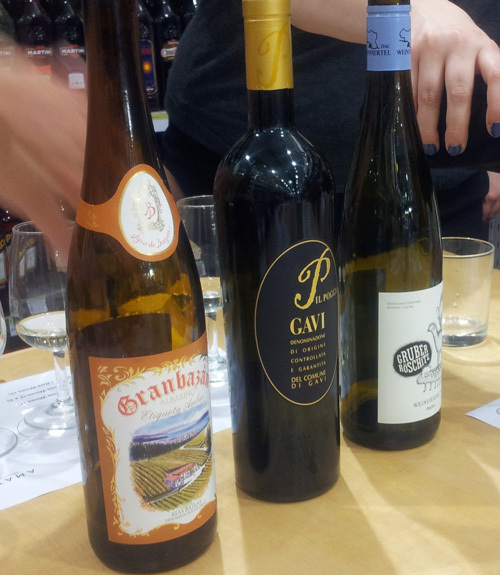 Round one was the trio of whites, carefully picked by Amathus’ Wine Buyer, Sarah Knowles. “These are all aromatic wines, and don’t worry – I am not going to make you guess the grape varieties on these – this round is about what you taste in the glass” begins Sarah. The first was a zesty lemon and citrus nose with a hint of elderflower, and to taste there was fantastic acidity and a delicious white pepper spice note too! The second had a warmer nose – almost baked apples – and the taste was softer on the palate but there was this delicious “stony” minerality there too. At this point Sarah explained that she had picked these three as they all had something more than just fruit on their taste profile. The first being spice and the second being minerality – so we all delved into the third to try and decipher what this one might show… It was more yellow in colour and there was a lovely smell of orange blossom and peaches on the nose that followed through to mouth along with apricot and tropical notes; and that extra taste, which you couldn’t miss, was an almost salty quality to the wine! Whilst tasting these we had a delicious piece of smoked salmon sushi – that went unbelievable well, especially with the final white! Revealing the wines; we discovered the first was Ewald Gruber’s Gruner Veltliner from Austria, the second was an Italian white Gavi di Gavi from producer Il Poggio, and the third white was a wine from Spanish producer Agro de Bazan and was the Equita Ambar made from albariño grapes! Round two was two pairs of rosé wines, one still pair and one sparkling. Sarah told us first to look at the colour of the rosé wines. “Rosé doesn’t need to be pink,” she explained, “this is a decision that is made from the producer himself that chooses when to take the skins away from the juice. The long the skins are in contact, the pinker the resulting wine and also the more tannins and body there will be.” The first rosé was very pale, almost salmon, and smelt of strawberries and cranberries. The taste was light and refreshing, and surprisingly dry. “Rosé is becoming more sophisticated. It is largely drunk in France as a serious wine, and the preconception of rosé being just for women is starting to lift in the UK.” The second was much darker in colour and there was a smoky note on the nose that intrigued us all – and a smell that we would be well familiar with by the end of the tasting. Again there were cranberries on the mouth, that smoky note remained and there was a slight (pleasant) bitter note too, like aperol almost. With this first pair we enjoyed a piece of chicory with pecorino cheese on top- and surprising for a rosé but the second rosé was incredibly paired for this little nibble. The next two rosé wines were unmistakably sparkling. “You can tell from the bubbles, the quality of sparkling wine. Fine, persistent bubbles (i.e. they are moving for a long time) means the great quality wines – and it was clear these were both in that category. The first had notes of brioche, vanilla, toast and strawberry, a luscious round mouthfeel and a satisfying and tasty finish. The second sparkling again showed notes of brioche but was more complex as, again, that slight hint of smoky/farmyard smell was present. 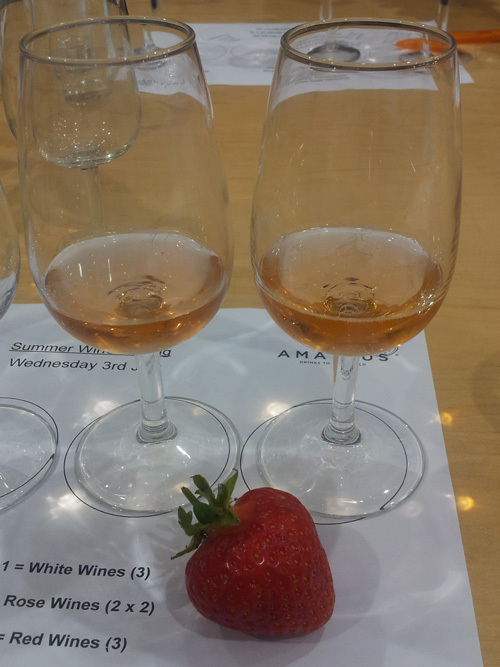 Slight softer in the mouth and a longer finish, and paired beautifully with a large rip strawberry to taste alongside! Revealing the still wines; the first was a rosé from the Provence region in France from producer Chateaux de Nestuby – a blend of grapes including Mourvedre, Cinsault, Grenache and several more. The second of the still rosés was from a French producer that produces New Zealand wine in Marlborough, Georges Michel, and is 100% pinot noir (hence the smoky notes). Sad to be moving on to our last set of wines, we progressed to the trio of reds. Unusually though, the first of these was slightly chilled! Intrigued we picked this up and started the tasting. Notes of blueberries, cherries and a hint of black pepper, this was a delicious red wine that was smooth, soft and low tannins – which is why it works chilled. The second red wine had an incredible cherry aroma, was much higher tannins and bigger bodied, filling your mouth, and had a lovely long finish. It was one we would all agree would go superbly with a summer BBQ and went very well with the selection of cured meats that appeared on the table! The third one had an unmistakably different colour, with tints of orange and brown. We picked up the wine and there were notes of strawberry, cranberry, leather and undoubtedly that lovely earthy, farmyard smell – this has to be a pinot noir! Revealing the wines; the first was from Beaujolais made with the gamay grape from producer Manoir du Carra, the second was an Italian valpolicella from Le Ballerine, and the third – of course – a pinot noir from New Zealand and another from Georges Michel! It was a fantastic evening filled with interesting facts, delicious wines, and we all learnt how to smell a pinot noir wine! With everyone staying to finish the remains of their wines and not wanting to leave a drop, it was clear that we would all be signing up to the autumn one – thanks Sarah! < Previous Cabrito/ Centinela Cocktail Competition 2013: The Heats are really getting Fiery!